“0 Deaths, 0 Injuries”–that’s what the newspaper headline inside my head read in the aftermath of the mental hangover that was the World Cup for Favela Experience. Of course, maybe the same couldn’t be said for the crusading hordes of Argentine fans, at least in terms of the masses who caravanned back to Buenos Aires with dead spirits and injured hearts. But guess what–we did it! We quite smoothly provided accommodation in two favelas across 10 properties for about 175 guests from around the world over the month-long World Cup period. Better yet, all that activity generated around $45,000 US dollars for favela host families. Putting that in perspective, minimum wage is about $10 US dollars per day here, and Rio’s one of the most expensive cities in the Americas. Above all, no one died, and I proudly say that only somewhat in jest with skeptics in mind. Whether it was football hooliganism, theft, or opportunistic gang invasions, many journalists, advisers, friends, and potential customers doubted the security of guests in our accommodation and more generally the neighborhoods where we work, particularly during World Cup pandemonium. As has been the case since Favela Experience housed its first guests a year and a half ago, none of our guests reported any crimes committed against them inside the favelas. However, some guests were dog-piled on and robbed during the celebration of a Brazil goal while in the official FIFA Fan Fest viewing area of Copacabana beach. That’s just another anecdote among many that I can point to when travelers reflexively choose to stay in traditional tourist neighborhoods out of safety fears, even though that’s where they’re targeted. Beyond that, guests were generally satisfied, in spite of our worry that the higher prices for the World Cup could have led to unrealistic expectations of comfort and service for favelas. One guest even wrote me, “[…] this has been the best experience of my travelling life.” Luckily, a positive contributing factor was that our properties had relatively few issues with the supply of water, electricity, and internet, which have often sparked the most complaints from guests who struggle to temper their “First World” expectations. I guess the Brazilian president’s current reelection bid and desperation to look good on the world stage had something to do with the reliability of public utilities. If only that urgency and public pressure could hold year after year. There were a few incidents nonetheless, but perhaps the oddest was that some Singaporean guests were flying an aerial photography drone off the rooftop of their rental property. When the host found out, he had to calm the nerves of his neighbors, who’d probably never witnessed a camera-equipped drone buzz past their windows. Fortunately, the hyper-suspicious pacification police in the favela didn’t cause any problems. While water conservation, respectful noise levels, and cleanliness appear on our list of rules for guests, I never expected I’d have to add “No drones” on there as well. Yet, for me, what was most encouraging was the vast diversity of our World Cup guests. They ranged from single male Latin American soccer fans to an American couple with four small children to even a group of 18 French teenage percussionists and chaperons sleeping on the floor of an NGO’s ballet studio. After all, Favela Experience’s mission is to expose travelers to the reality of favela life and break the negative stereotypes about these communities. Regardless of the fact that many of our guests may have booked with us to save money, they were forced to confront both the lively, welcoming nature of our favelas as well as the most pressing problems, such as open sewers. When their jealous friends at home question our guests about their exotic soccer vacations, their true stories instead of sensationalized media reports are what spread to change the perceptions of tens or hundreds times more people than our actual volume of guests. That may very well end up being the greatest impact we have on the world, and it’s an important one to be proud of. Also key is that we couldn’t have pulled off this success without the steadfast support of two top-notch interns on the ground in Rio. 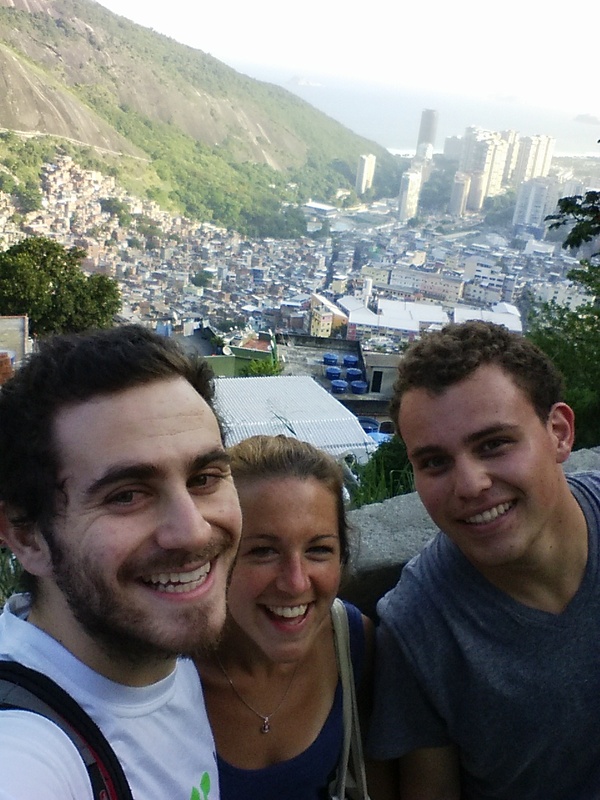 Daniel from Costa Rica and Jo from England ran the show in the Rocinha and Vidigal favelas, respectively. Without them, there would have been some disastrous outcomes. They learned first-hand the challenges of hospitality, whether it was waiting hours for a delayed guest arrival on the street at the favela entrance or translating with police for a worried father whose drunken son had wandered off without returning for the night. I’m deeply grateful for their no-complaints, get-to-work attitude, and I hope they can draw upon their experience in future academic and professional endeavors. Ultimately, though demand was in step with our housing supply during the World Cup, what most constrained us was what most new businesses with grand aspirations run up against—trouble scaling. Specifically, it was tedious and costly to manage logistics and service for each customer’s stay. Cobbling together Google Drive forms and spreadsheets was a headache to customize for the unique components of each guest’s stay (e.g., group size, bed configuration, transportation, language spoken, etc.) and often last-minute requests. We ended up copying and pasting sections of text over and over into emails with frequent modifications specific to each guest. A few times we’d make careless mistakes, occasionally resulting in confusion particularly around the check-in process. Of course, it didn’t help that guests usually lacked working cell service in Rio and sometimes would change their arrival plans without notice. Now amid the lull of the low tourism season and two years before the 2016 Summer Olympics in Rio, we have a chance to adapt our very high-touch, low-tech service model to accommodate magnitudes more visitors. While part of the value we offer guests is the friendly virtual and in-person contact with other foreigners who know the favelas, it wouldn’t make sense to continue this element in the clunky way we do now when at a greater size. The way I envision Favela Experience growing in the future requires us to standardize our processes across all guests and hosts and shift more responsibility for guest logistics to hosts themselves, thus becoming more of a product or platform and less of a service. However, there are big changes coming soon I’ll talk about, so I don’t want to speak to soon before little has been decided.